To paraphrase Mark Twain, much of what people -- including even some economists -- know about economics is wrong. For example, over two decades-plus, we‘ve heard economic forecasters warning that America‘s big budget deficits would spark runaway inflation. It never happened. Also, we‘ve heard that relatively low saving rates in the U.S. would give high-saving nations like Japan and Germany powerful advantages. In fact, the U.S. has far outperformed its rivals in economic growth, productivity gains, and employment increases. 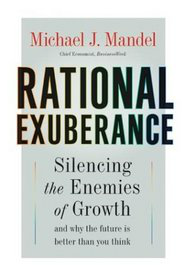 Going forward, as Michael J. Mandel explains in Rational Exuberance, summarized in part one, the U.S. economy is likely to benefit from major technological breakthroughs in biotechnology, nanotechnology, solar and hydrogen power, and space exploration. Mandel is the chief economist at Business Week and he holds a Ph.D. in economics from Harvard. He insists that productivity growth and continuous innovation are the factors that are leading us toward a bight future. In this summary, we‘ll explain why it is rational to be optimistic about the next decade - if we are willing to commit ourselves to exuberant growth built on America‘s advantage in innovation.